By all accounts 2011 was an incredible Sting packed year for me that saw me be an “Englishman in New York” several times throughout the year, at the Fan Club show at the Apollo, Sting’s Birthday bash at the Beacon and twice at the Roseland Ballroom Back to Bass concerts. Surely another trip stateside before the end of the year was out of the question? I had successfully negotiated to take some time off work just before Christmas to go to Vancouver. How I did it, I don’t know? I must have had the luck of Carter, although bizarrely two work re-structures, new line management and moving office all played their part in swinging things into my favour. Like all well laid plans, they are subject to change, (at a moment’s notice) and this latest trip wasn’t as first planned, you won’t believe me if I said, it wasn't my intention to end up in Seattle this fall? Ann talked me around, not that I needed any convincing, it’s quite comical how quickly a passing suggestion turned into fully fledged reality. By all accounts I was leaving things unusually late for me to book things up and there was this little question of getting a ticket for first night in Seattle (at the last minute). What transpired over the rest of the evening was an unlikely pairing of characters propping the bar up and being the soul and life to an otherwise sterile and lonely hotel bar / lobby area in the conversation department. It was like I had just met the Bulgarian version of “Carter!” I was only on my first drink and couldn’t understand him? The next morning I thought the builders were knocking down the hotel, there was dust everywhere, and drilling, no signs or caution tape to guide the weary guest, everyone seemed to be wearing hard-hats apart from me? The general aura seemed to mirror the economic gloom being felt in the country, I couldn’t wait to escape, start my travels and have a tomato juice! I had previously been in Seattle on the Police Reunion tour, so had left some time at the beginning of my trip to do the sightseeing I didn’t manage first time around. All the shops were dressed for Christmas, the local shoppers were out in force, but top on my list was a Sting ticket for the first night concert. No normal person checks a venue’s website at such a time, but I was wide awake. I saw there were tickets still available and thought I would buy my ticket direct from the box-office first thing that morning. I was first in-line but surprised to learn, all the tickets had now sold out. I returned several times during the day, only to get the same reaction. Looks like this would be the first time I would be sitting out a Sting concert. I walk back to the hotel again, and check on the venue’s website via my iPod, still no change. I’m now convinced I’m going to be spending the evening on my own pouring aguishly over my wine glass in a downtown Seattle bar, looking like some miserable guy who’s just been dumped after 25 years? It’s now 1pm and still no joy, I lie down on my bed and drift off to sleep for about 20 minutes. I get up and check my iPod again, (thinking nothing would have changed), and that ticket I had seen at 5am was now there on the website again. (That’s one way to get me awake!) What followed was a frenzied attempt to book the ticket on an iPod. Yes a tiny iPod (not an iPad), so what a time to get a “Server error message”, I tried in vain, but when it finally worked the site kept timing out on me. I need a full sized keyboard; there must be a business centre in this hotel? To this day, I don’t think the staff have had to deal with anybody like me? I look flustered as I almost trip up, exiting the lift on the twelve floor to introduce myself to the business centre reception. I explain what I’m trying to do, my English accent stands out a mile, and I’m quickly directed to a room full of computers, I’m the only guest there. The staff couldn’t be more helpful “would you like anything to drink sir, tea, coffee?” Given the state I was in, I felt like asking for a double brandy and coke, but settled for coffee. Please let that ticket still be there, I filled my details with such hast and vigour, I was already hitting the buy button as my coffee swiftly arrived. “How are you getting on sir?” I remain silent momentarily as I’m now staring at the credit card authentication icon; it seems to be taking ages, (as if it’s going slow to deliberately wind me up), transaction confirmed. (Result!) “I’m just printing my receipt”, I reply. What a relief (like in the lyric “There’s no religion but….”) I’ve sorted the music part out, with all this hard work; I’m starving, time for some food. I was pumped up for the first Seattle concert, maybe a little bit more than normal probably because I didn’t think I’d get a ticket. I’m more than happy for a row 15, aisle seat at such late notice. What was striking and good to see was how lively the Seattle audience were on both nights, they were up most of the night. It is Seattle night two which will hold the fondest of memories, not least because I am able to share the magic of the concert with my friend Ann in the front row. We have been to several Sting concerts together, but she has never experienced one when she is sat next to me before? Even before the concert started, things seemed a bit different; we were getting a lot of interest from other members of the audience. When I start talking to Howard Page (who is doing his final technical checks before Showtime) and Ann and I talk to Danny, heads start to turn; you can hear the whispers from the rest of the crowd. You can tell what people are thinking, when I open my mouth (the English accent is like a pheromone sometimes in America), you can hear the amazement in people’s voices, you came over from UK for this concert, well, “yes, actually” I reply in a matter of fact tone, as if somebody had just asked me the time. Little do these people know the places I’ve been on my Sting travels this past month alone, let alone the year itself? I seem to remember I recalled to this person, a story of a work colleague whose specialist area of research was of fandoms’ or fan subcultures as it’s known in the press. He was fascinated by some of my previous tour travels, and thought music fans were different from Sci-fi fans or train enthusiasts, sadly he died before he could interview me before that line of scientific analysis catches up with me. Nothing beats hearing the throng of excited people at the start of a concert when Sting walks on stage; it’s another reaction when the first few rows start laughing, as Sting recognizes me straight away, as he walks up to the microphone. His beaming smile and warmth is priceless as he stares down at this English fan with a brightly coloured Jimi Hendrix tee-shirt on. A fact not lost on Sting as the previous night he paid tribute to him in one of his introductions to the vibrant Seattle audience. He launches into “All This Time”, I can’t help but wonder, if Sting thinks I’m being ironic singing the words back (All this time, he was there last night as well he’s probably thinking), and even this early on I realize my voice is already starting to carry? There are so many special moments on this tour, I really don’t want to give too much information away, but if you are one of those people that want to rock out, you can’t beat "Demolition Man" to get those legs moving for starters. The vibe from the audience was lively and energetic, I was jumping around enthusiastically, Dom was looking over at Ann laughing and as if to say what is your friend like, is he for real? My unique style of dancing was now getting noticed by a quizzical Rufus and an intrigued Peter Tickell. The only person that was not fazed was Jo Lawry, who is incredibly observant of my dance moves, (a fact I learnt earlier in the year in Nimes) who held a beautiful composure as the rest of the band were desperately trying to keep a straight face? Then there are moments that happen in concerts that stand out a mile for a number of reasons. Ann recalls the story of when Steven Mecurio met us in Newcastle (on Symphonicities) and referred to me as “You’re the guy during King of Pain!” I really don’t set out to be a focus of attention, in fact I’m terribly shy, at which point all my friends burst into fits of laughter. But if Sting is having a sing-along during "Message in a Bottle" why am I the most noticeable voice? I don’t think I am, I just don’t think anybody is following my lead, I seem to appear to be louder, when everybody is choosing to be quiet? So Sting is trading the lines “Message in a Bottle” with the audience, I’m belting out the response in tune and with passion, “Message in a Bottle…..Yeah” (almost with an American twang) Sting smirks at me, Ann bursts out laughing, it’s another “Newcastle moment” Roger is cracking up Sting again, he looks at me and says “You’re Good!” My pre-concert drink of choice was keeping my vocals in order then? When you have such an amazing experience in the front row in Seattle how would Vancouver compare? More a case of stamina, will my voice last out, I danced the night away like the age of a shop I’d seen in downtown Seattle called Forever 21. My hotel room is on the fitness floor, I’ve had my workout without having to use the hotel’s facilities, and will I have enough energy to last the tour? The first thing was to cross the border into Canada. I travelled with Ann by car, I knew there would be questions at the border crossing, just not so many? It started pretty normally, reasons for visiting Canada, pretty standard stuff. The more the questioning went on, the more the official didn’t really understand my answers? She could understand the three concerts part, but the same venue and the same artist as well? I felt like saying you should meet some of my English friends, it’s pretty standard practice where I’m from. So for the classic question “How many times have you seen Sting?” “On this tour” I reply. (Ann is trying not to spontaneous burst out with laughter) “No in Total” the official dolefully replies. There is this pregnant pause as my poor brain tries to do the math? I’ve never calculated a total; you could sense my expression of panic clearly on my face trying to physically count out every concert I had been to, I might have to reply long hand (that might take a thousand years?) For the sake of brevity I picked my best guess. It was the official that was trying not to crack up now and tried to keep her composure by saying “we’re not here to judge you?” I couldn’t help but wonder how even more comical this situation would have been if Sue, Andy and Paul were with me? The official handed back my passport with a bright yellow piece of paper inside, saying I had to get my passport stamped inside. It was quite apt the paper was yellow; the form just had Sting written on it, concise or was this code for something? It was clear the first official had passed me over to her colleague for further questioning. My travel profile probably resembles a man who should have a wife in Mississauga than a tourist on holiday in Vancouver? I felt I was giving a history of the Police reunion tour in there, like I would briefly give to the concierge at the hotel I was checking into. The Concierge seemed impressed I had stayed in the hotel before and replied “it’s always lovely when the Police and the Fire service have a reunion” I didn’t have the heart to say I think we are talking about a different reunion? Out of all the Vancouver concerts it was the final one that I hold close to my heart. The suspense was killing me, I had a VIP ticket, but all I knew that I was somewhere in the first 15 Rows? I was anxious in anticipation, I was nervous and excited at the same time. There’s no way I could top my seat in Toronto (early on in the tour) or Seattle. I had nothing to worry about, Karen from Live Nation proudly exclaimed "you've got a great seat" I had the best seat in the house, front row centre, a fact not lost on Howard Page who joked with me about how I always seem to get front row centre? It’s a complete myth, in fact; I always have my greatest success in Canada and Germany very rarely in my home country (ironically) for the prized front row. As I’ve probably commented before there are varying degrees of Sting fan, basic, intermediate, advanced or in my case some may say Certifiable? So you would think by now some of my predictions of what’s happening in the shows should be spot on. I joke that I’ve given up predicting what Sting will do next, because I’ll be way off the mark. Will this song come into the set, will this one disappear? Do I hazard a guess; the set works so well I can’t see anything to change. If anything is going to drop off the set-list it will probably be “Inside” just because I don’t think the bulk of the audience know the song. You would think the majority of the audience would have a copy of “Sacred Love” but judging by the reaction of the Vancouver audience, maybe they don’t? If 'Ghost Story' got dropped I would see this as a great travesty of justice. You could hear a pin drop, you don't need words to convey your emotions, and it was obvious to everyone that a truly powerful and moving performance is playing out before us. Apart from the idiot heckler at the back in Seattle who shouted something out during the introduction, to put Sting off his words, first time Sting replies “I remember my first joint!” When the guy interrupts again, Sting replies “Whose show is this?” when this happens again, Sting is clearly rattled, “What’s your problem”, you could hear some scuffles at the back, the guy is probably being dragged out by security, Sting is unperturbed and delivers a faultless version of this song. The woman to the right of me was static (all night), apart from texting constantly at the start of the concert. It took an evil glance from me, and a bout of air drumming, when it looked like her beloved phone might accidentally be knocked skyward for her to stop texting. Much as I wanted the Vancouver audience to be as lively as Seattle, I knew early on, it wasn’t going to happen. Somebody in the second row called security to get people to sit down during “Demolition Man” which is one way of saying the audience did not want to dance. (Apart from fan club members) You could almost hear the relief from my neighbours’ that I'd sat down, this is rocking, and I’m sat down? But in spirit I wasn’t letting this small detail slow me down or quell my mood. I was more worried about other members of the audience; I actually thought some people might be statues they were that still? So at the introduction of "Heavy Cloud, No Rain", Sting says “Heavy Cloud?” It felt like there was one soul voice, who had stood up and shouted back “No Rain” (with arms aloft in the air), Sting is clearly impressed at my enthusiasm, where’s everybody else. I can sense the weird glances I’m getting; some people think I’m having some kind of private in joke with Sting himself, even though he is opening this up to the whole audience. I decided to limit the up and down routine of my “No Rain” replies, I’m sure I could hear Ann behind me laughing away at my moves. She later told me after the concert that people in her row had glanced over to look at her several times during the concert, wondering why at various points she burst into spontaneous laughter. Her reactions were picking up on my quirky little mannerisms and moves. If I don’t have the space to dance, or I feel I’m impeding someone’s view I will sit down and jig around in my seat. “Heavy Cloud” is one of those songs you can carry on air drumming quite happily. (I’m good like that). Until you hear it for yourself I can’t do justice to describing the musical fiddle pairing of Jo Lawry and Peter Tickell on 'Love is Stronger than Justice' and 'Never Coming Home' is the zenith for me in the set. I can’t wait to see my sister’s face when she hears this for the first time; I can visualize the “wows” to myself in response to this sonic majesty. The latter is definitely my signature tune now, I love how it builds from an almost trance like beginning to a totally climatic conclusion. At the start of the song I raise my hand showing "five" as I sing "it's five in the morning and the light's already broken". The whole combination and composition on display here is not only tight and well polished (as you would expect) but highlights each band members strengths to perfection. Jo Lawry really excels during “Hounds of Winter” particularly at the end of the song, when it is just her vocal, and coupled with Howard’s mixing, the vocal, as heard coming straight from the artist’s monitor, is truly stunning, angelic and moving beyond words. 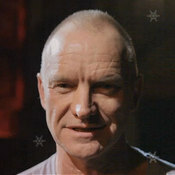 So we are at that point the North American leg of the tour is about to end, so Sting is trading the lines “Message in a Bottle” with the audience, he’s looking at me, smiling away, trying to keep composed, I’m singing away, someone behind shouts out “play Roxanne”. He might have just played a duff chord, and somebody else might have said “keep practicing?” The combination of everything happening in the moment Sting said “**** off”, only to proceed to laugh, and then saying “that’s really funny”, what was funny? The comments, me, a mix of everything, it was amazing he kept going. I really did think he was going have to stop and start again. For the first time on this leg we get an acoustic version of Roxanne as the last song, what a finale. What a totally fun packed and amazing trip, this highlights a mere fraction of just some of the sights and the sounds of my trip. I have to specially thank Ann and Marion for being such wonderful and kind hosts in Vancouver and to all the wonderful people I met during my travels, Emily, Trevor (way to go, Dude) and British Helen and Ann (again) for making Seattle a reality. All this excitement and activity of the last nine days had clearly caught up with me, I was waiting to board my flight home, and I’m sitting down listening to my iPod, 25 years on shuffle and “Never Coming Home” is blasting out of my headphones, I am so knackered, I fall into a deep slumber momentarily, until a fellow passenger trips over my legs, which wakes me up! It was just the wakeup call I needed, I decided to stand up and walk around for awhile, thinking if I sit down again I might fall asleep and miss my flight home? I’m leaning on the wall gazing aimlessly into the distance when an announcement goes out for first and business class passengers to board the plane. I’ve still got some more time to wait, I glance over at the boarding gate, to see a man with a guitar on his back (who looked incredibly like Dominic Miller) proceed to board the plane. Didn’t think anything of it, my mind is playing tricks on me, I’m barely awake. It’s not until moments later Billy Francis says hello to me and smiles, I know I’m not dreaming. 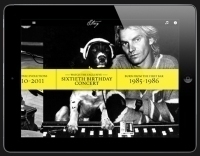 Today, an audio podcast will be released in which Sting reflects on his enduring 25-year solo career and launches his free STING 25 ‘appumentary’ as part of the latest installment of the "Meet the Musician" podcast, available in the App Store on iPad or at http://itunes.apple.com.